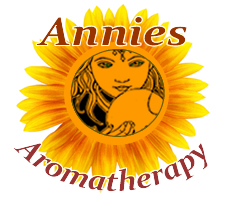 Preparation Methods & Dosage :Ethanolic (alcohol) or lipophilic (oil) extractions; Not recommended for use in teas or infusions. 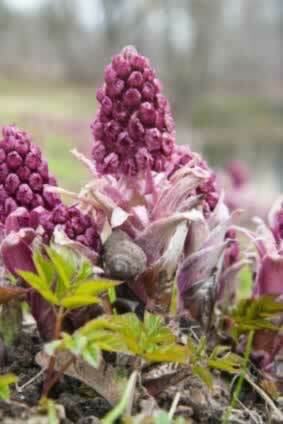 Butterbur Side Effects: Butterbur contains pyrrolizidine alkaloids and its internal use is not recommended. 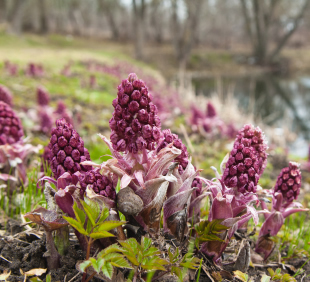 There have been some reports of liver damage associated with the use of butterbur root extract. It should not be used by pregnant or nursing women. Not recommended for long term use. The name butterbur comes from the old use of the wrapping butter in the large leaves. Called plague flower in the old herbals, because of its value as a remedy in times of calamity. It is under the dominion of the Sun and therefore is a great strengthener of the heart, and cheers the vital spirits. The excellent Fuschius, in his account of this herb, is most express, and records its virtue as wonderful in pestilential fevers; and this he speaks not from tradition, but his own experience. Were it needful to prove the sun gives light, it is scarcely less certain or less obvious, than that this root, beyond all things else cures pestilential fevers, and is by long experience found to be very available against the plague, by provoking sweat; if the powder thereof, be taken in wine, it also resisteth the force of any other poison. The results of the trial concluded that the use of two 75 mg tablets per day of the proprietary butterbur extract Petadolex®(Weber & Weber International, Windmere, FL) in migraine patients helped to reduce the occurrence of migraines by an average of 48% during the four months of the trial.